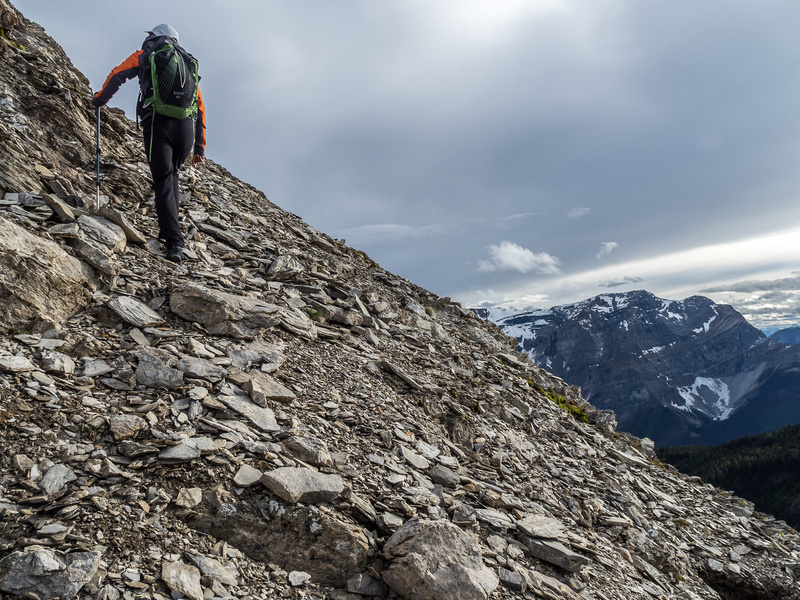 Difficulty Notes: Easy scrambling from Fatigue Pass with some exposure on the ridge that is mostly avoidable. Very long day from the Sunshine parking lot if approaching and returning on the same day. 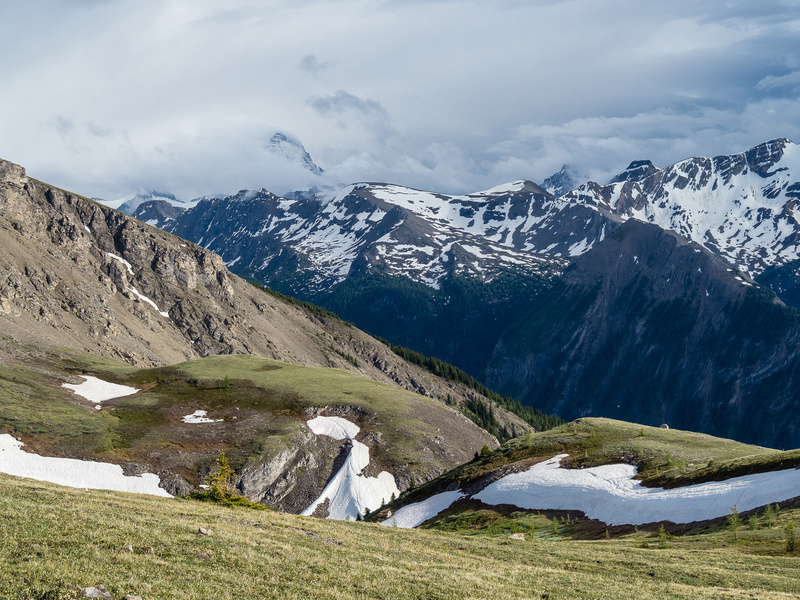 After successfully completing my second ascent of the diminutive Citadel Peak (with it’s not-so-small views), Phil and I returned to our waiting overnight packs at Citadel Pass and prepared for the uphill trudge towards Fatigue Pass. I’d often wondered what this pass looked like and Phil also remembers wondering about it on his way to Mount Assiniboine years previous. We were about to find out. 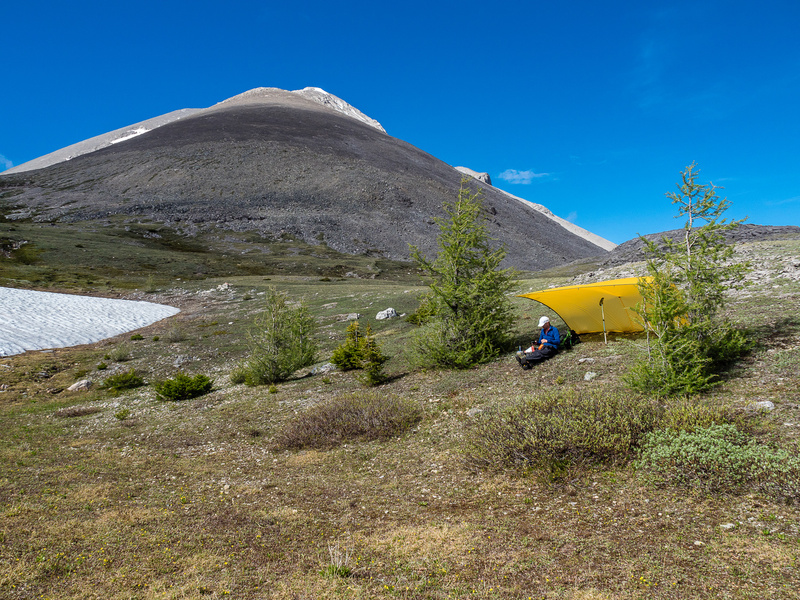 I had no idea if there’d be decent bivy sites at, or near the pass but as part of our July long weekend peak bagging adventure in the area, finding a bivy site was key. 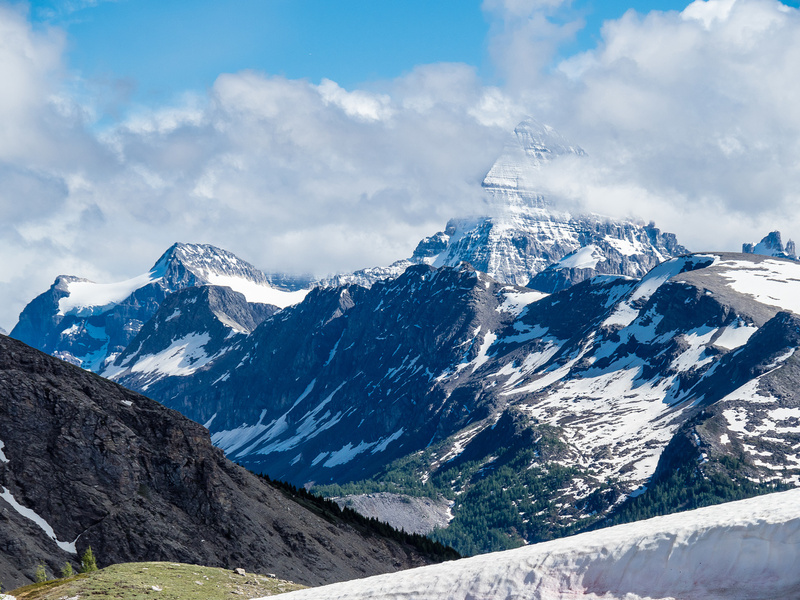 We had to stay out of Banff National Park to avoid fines, and Fatigue Pass was really our only option, being just across the border in British Columbia’s lovely Mount Assiniboine Provincial Park. Unfortunately for me, I’d been “scooped” on Golden Mountain, simply due to not being able to prioritize it over the years since I first came across Rick Collier’s likely first ascent trip report on Bivouac.com. I knew Rob Schnell and Chris Moneypenny had skied / scrambled up Golden Mountain a few years previous in a brutally long day from the Sunshine Meadows and an even more brutal return via Brewster Creek. Rob reported back that the terrain was easy, so I had no concerns about it. Our only concern on this particular weekend was the weather. We planned to bivy at the pass right under the north end of Golden in order to give ourselves as many shots at it as we’d need in the iffy weather. As it turns out, we only really needed one. From the signed turnoff on the main Citadel Pass / Assiniboine trail the Fatigue Pass trail quickly faded. Thank goodness for cairns or it would be completely gone. The only place with a defined trail (still faded and slowly disintegrating however) was on the switchbacks up to the pass. The views were awesome as we ascended the old switchbacks with obvious damage from a Grizzly bear who’d used the flatter trail to stand on as s/he ripped the uphill slopes to shreds! 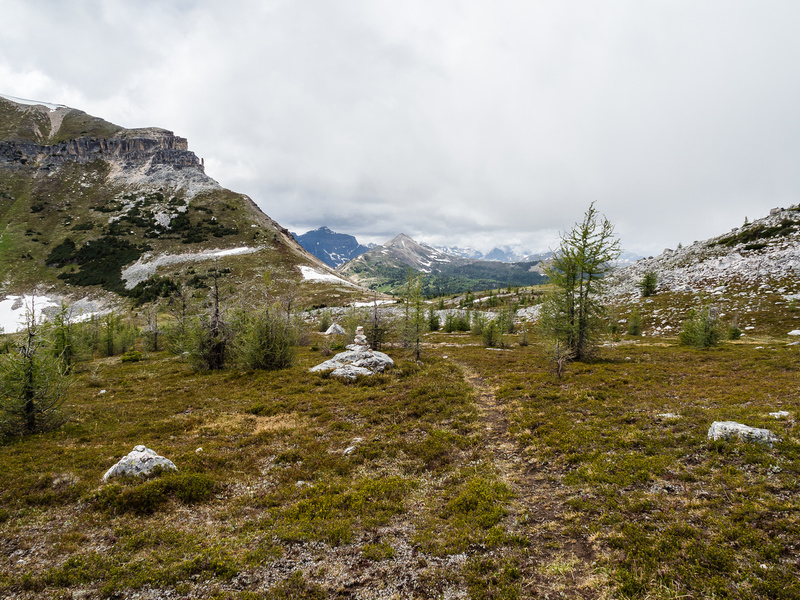 Our tired legs were rejuvenated with the view as we crested the trail and continued across to the pass, now following cairns again as the trail vanished under our feet under the wide expanse of the large alpine meadow. 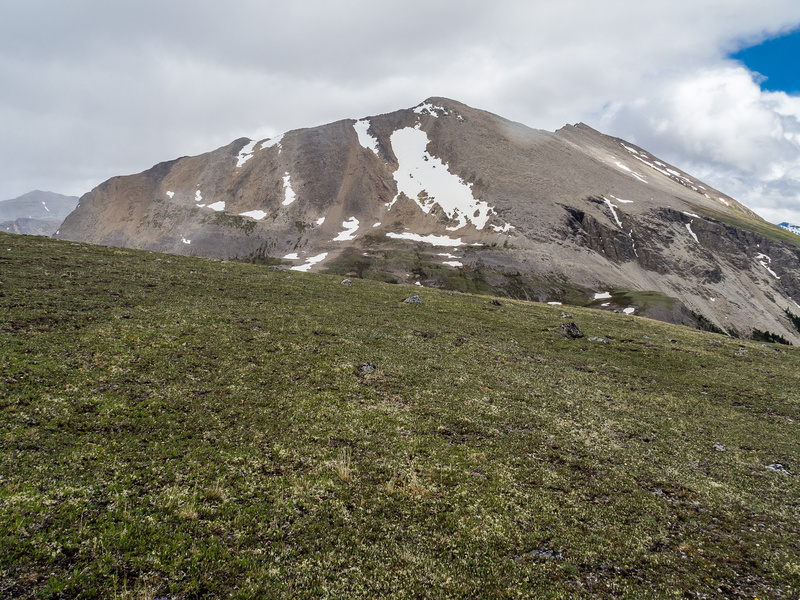 We wandered slowly across the rolling terrain, looking carefully for an appropriate bivy site. 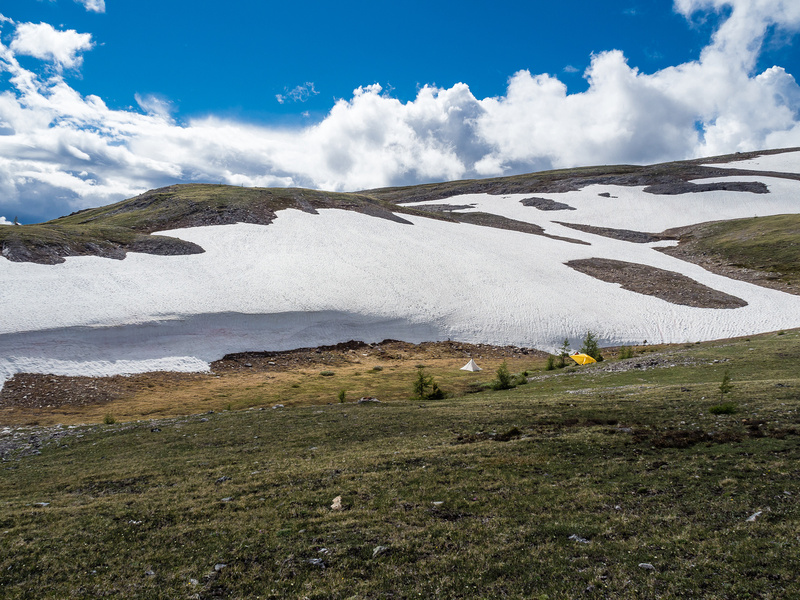 Our patience paid off in the form of a perfect bivy site located just off a large snow bank on soft grass, protected by west winds and tucked under the interesting looking south ridge of Fatigue Mountain. We set up camp and enjoyed re-hydrating and re-energizing our tired bodies in surprisingly warm and sunny weather. 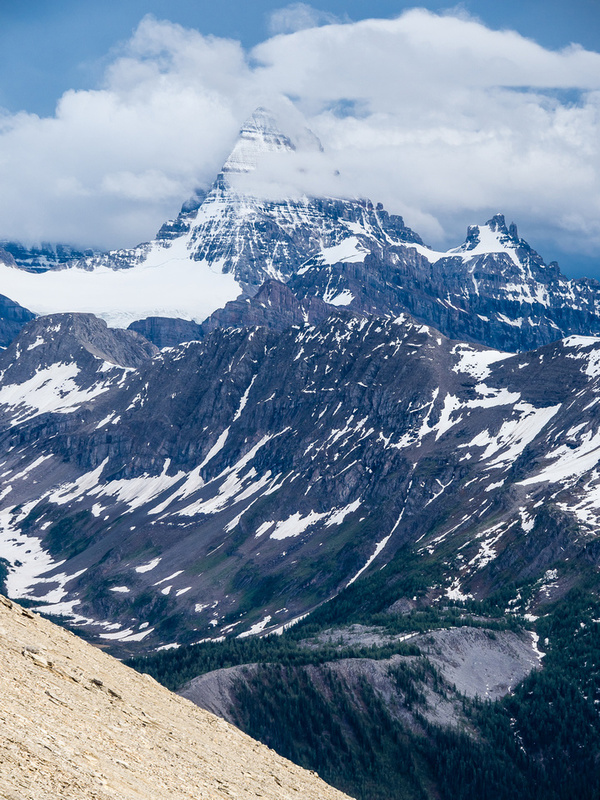 Even Mount Assiniboine’s summit was visible off and on from our camp. After an hour or so we started thinking that maybe we should take advantage of the current weather and bag our third summit of the day. Why oh why do we get bored so fast?! 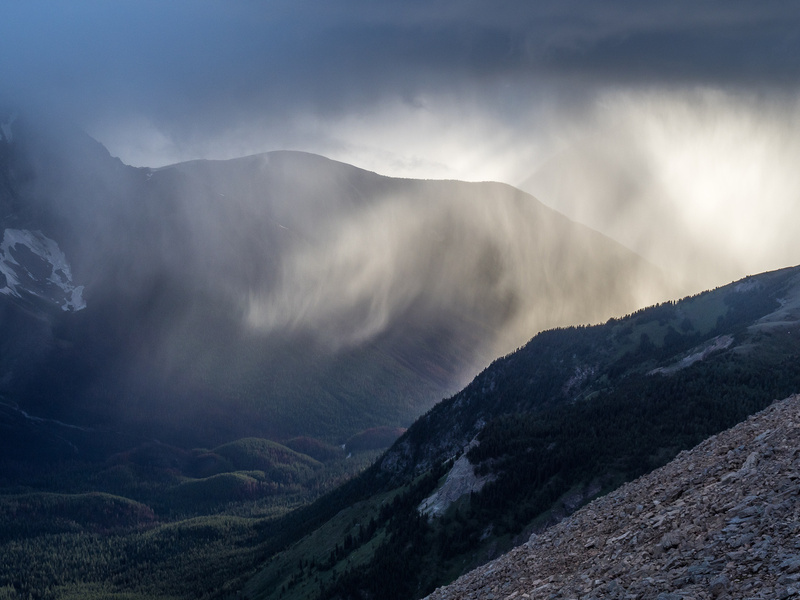 We tidied up camp and set off for the north end of Golden Mountain only to turn back almost immediately with very threatening skies appearing to the NW and headed straight for us. The weather hit us and we dove into the mid for a while. I fell asleep reading my book, only to be woken up by Phil muttering about the tent being “bloody hot” – the sun was shining again. 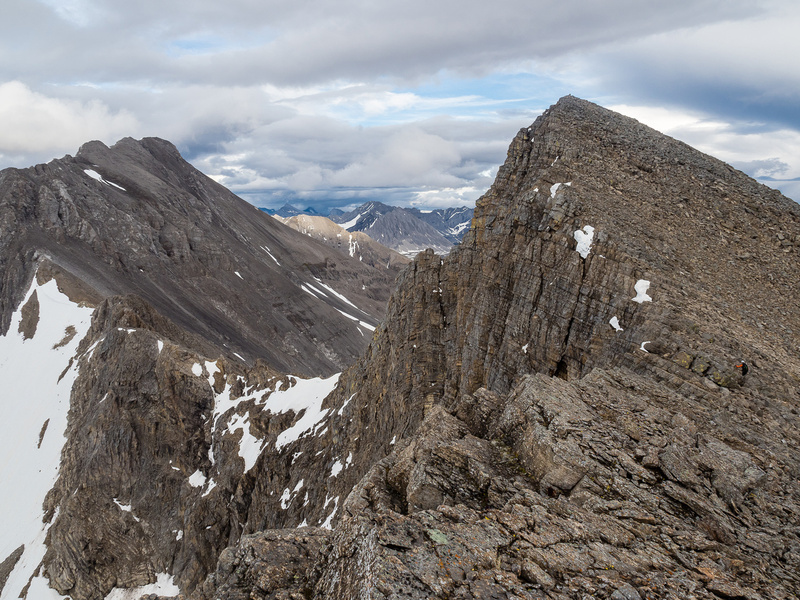 great view of Fatigue Pass with Golden Mountain’s north end and our bivy. The second attempt was the charm. Upon receiving a note (via Phil’s InReach) with news of mainly cloudy skies the next day, we decided to make a late day charge up Golden Mountain while the clouds were pulling back a bit in the evening. 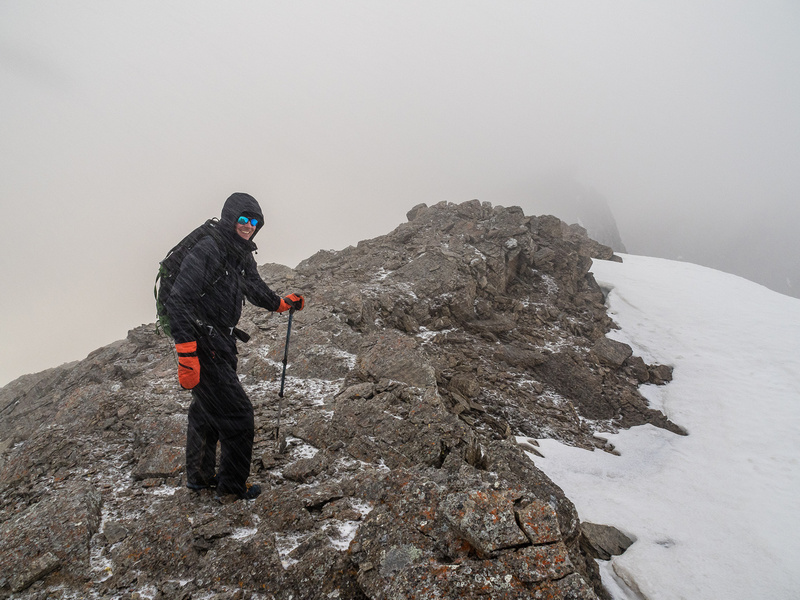 I’m not gonna lie – my legs were feeling fairly tired as we ground our way up the scree slopes on the north end of the ridge to the first false summit. By the time we were staggering over the third false summit I was a bit grumpy, but extremely happy to see the real summit not far away. 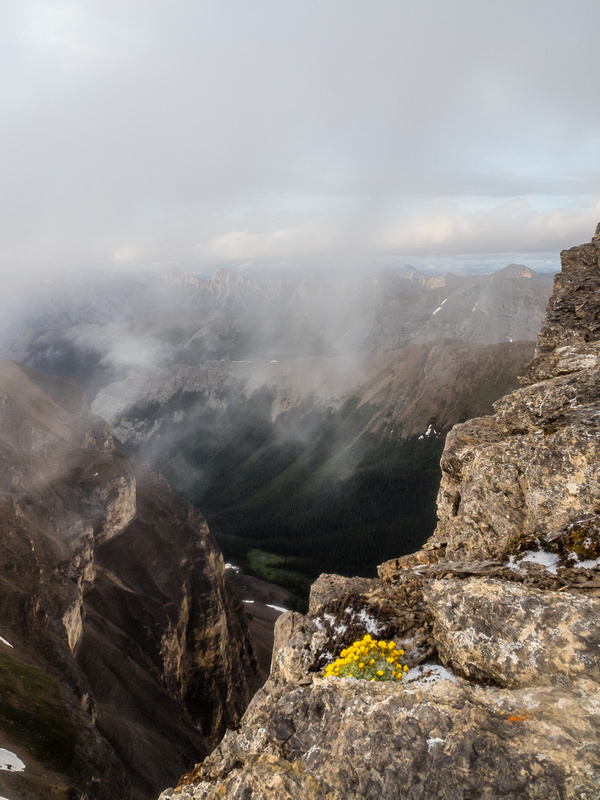 We had brief views of Mount Assiniboine from along the summit ridge but by the time we made the summit she was firmly entrenched in clouds again. 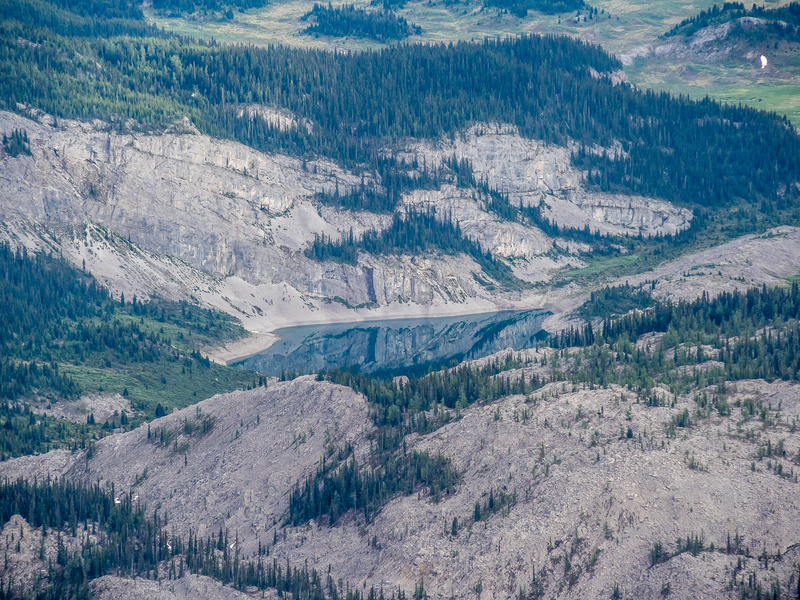 Yet another surprising tarn under Golden’s east cliffs entertained us, as did the stunning views of Nasswald and the Assiniboine meadows over Og Lake. It was neat to see the many familiar summits of the area that I’ve stood on over the years. I was happy to see a register in the summit cairn, but I have to admit it was a bit deflating to see three entries in it rather than just Rick’s and Rob’s. The peak also had an ascent in 2017, indicating that possibly it’s ascended much more often than the records would indicate or that I just waited too long for my ascent. Oh well. A fourth recorded ascent isn’t too bad for such a prominent peak! It beats the pair of 6th recorded ascents Phil and I have had recently on Mount Morrison and Mount Currie. At least we’re going the right direction here. 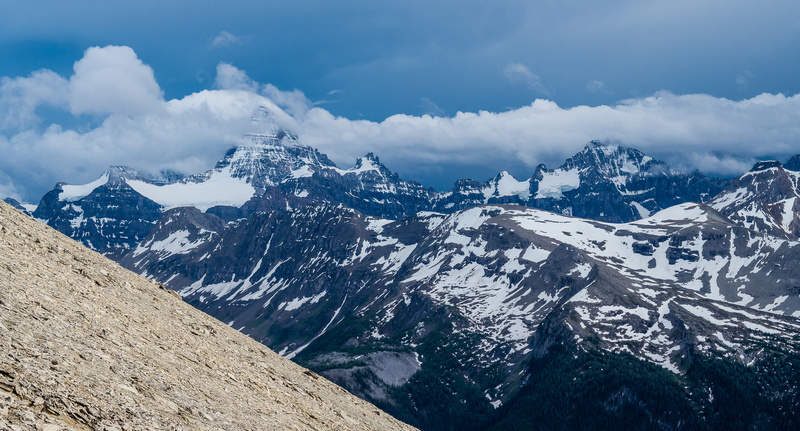 As we ascended and slowly made our way further south along the ridge, Mount Assiniboine finally came into full view granting us some wild scenes. 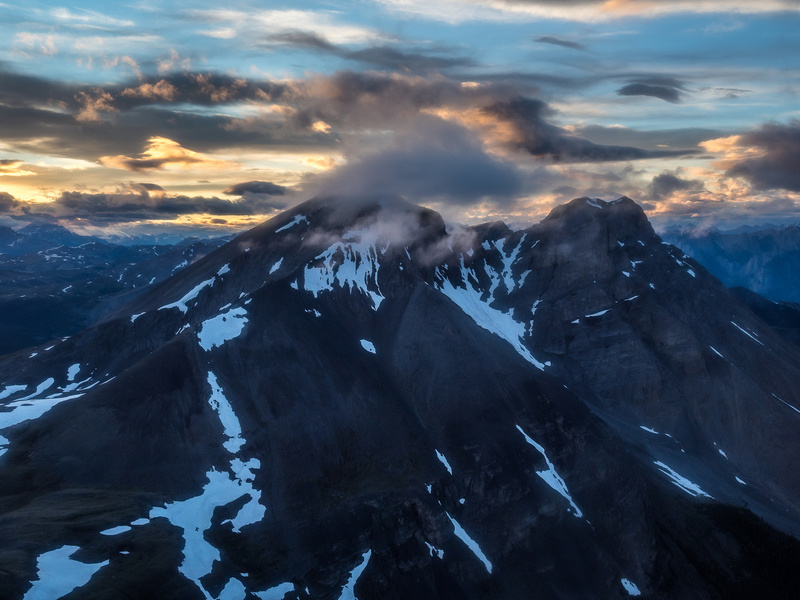 Surreal lighting as we continue to work our way along the never ending summit ridge of Golden Mountain – Assiniboine still showing at center distance. 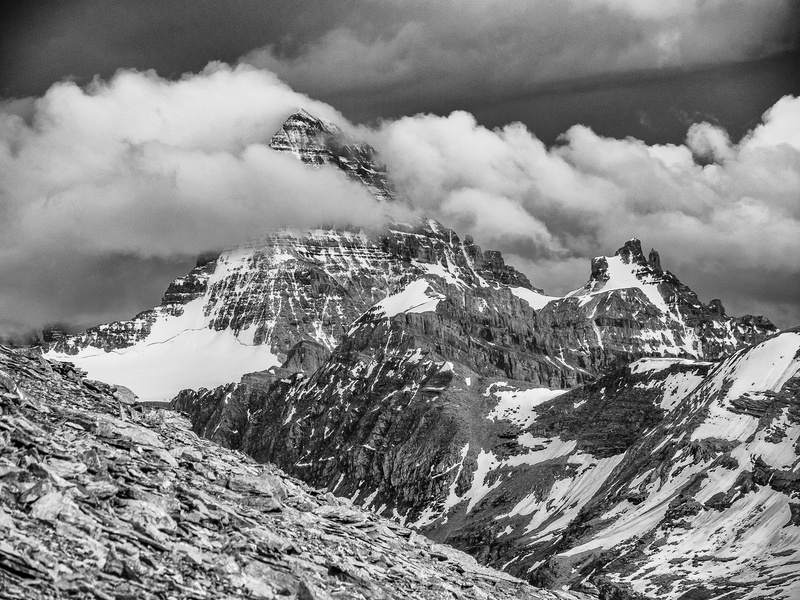 As the cloud cap thickened over Assiniboine, I snapped this last shot of her summit before it socked in again. The Marshall at distant right here. 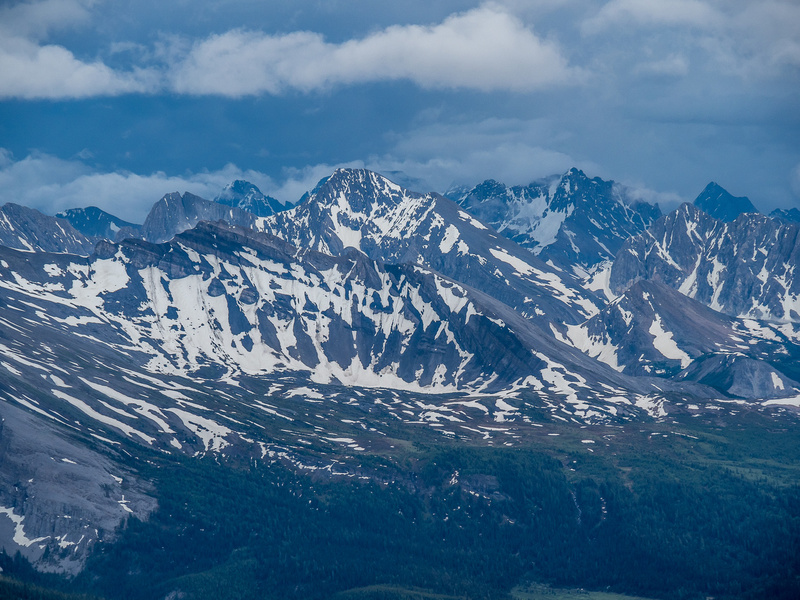 Only two more false summits… Nasswald at center here, with the summit of Golden Mountain to its right. Looking back to the north where we came from, another storm front is quickly moving towards us in the fading light. 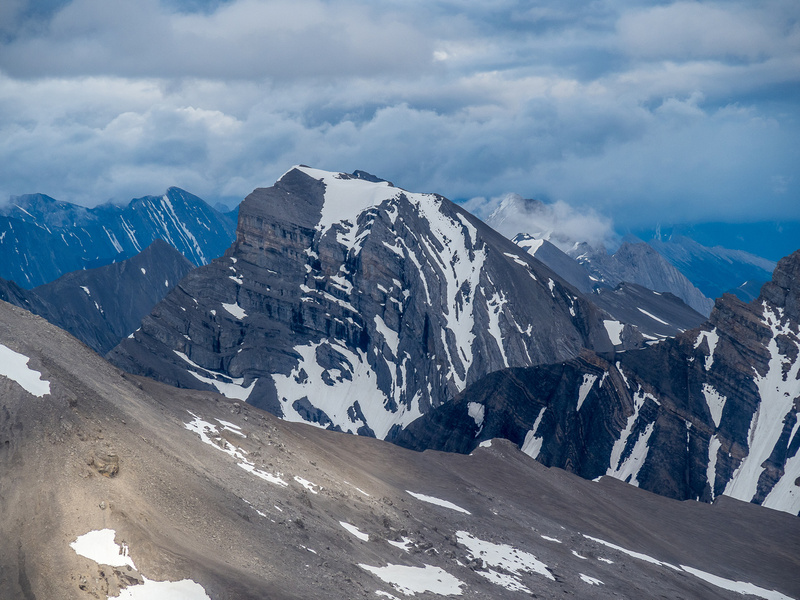 Summits visible include (L to R), Simpson Ridge, Citadel and Fatigue Mountain. Setting sun on Nasswald Peak. There is a difficult scrambling traverse between Nasswald and Golden which Rick Collier did in 1993. Phil awaits the storm just under the summit of Golden Mountain. 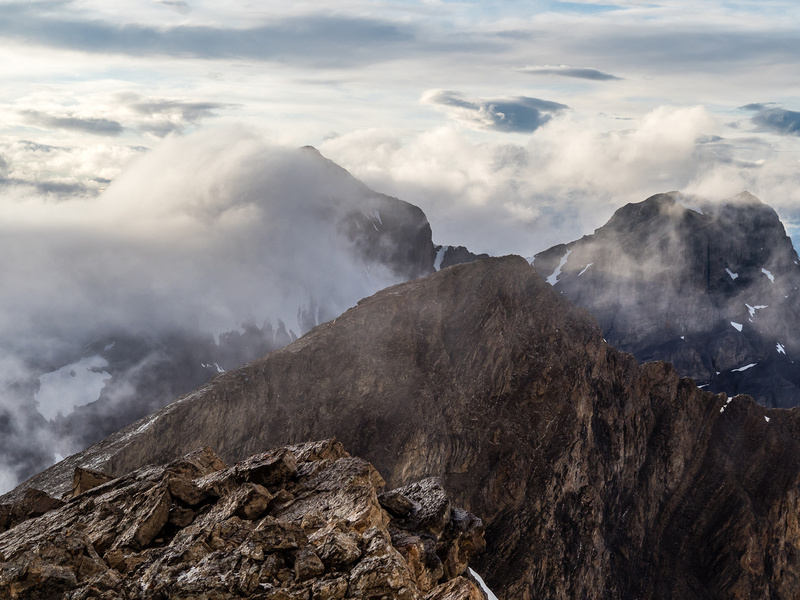 Likely because we were tired, we made the dubious choice to sit out an approaching storm at the summit of Golden – hoping against hope for the Matterhorn of the Rockies to clear of clouds. We found comfortable seats and sat down to wait. And wait. And wait. Hmmm. The storm looked very threatening but wasn’t moving quickly enough. We changed our minds and were now in a race against the setting sun to make our camp before nightfall! 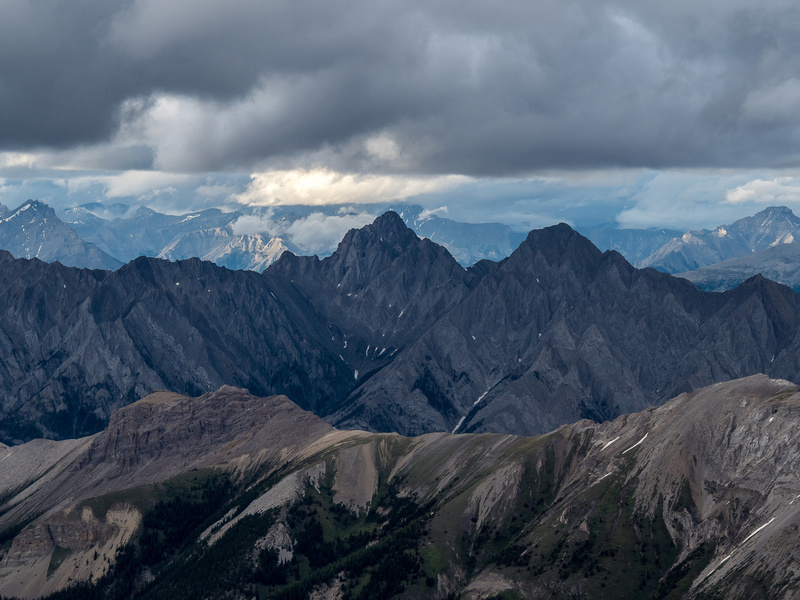 As we stumbled and bumbled our tired legs back across and over the false summits of Golden Mountain’s long ridge we were slammed by the approaching storm. Thankfully it wasn’t an electrical one! We got some very interesting views through the storm front to the setting sun before it started to sleet and even snow on us. 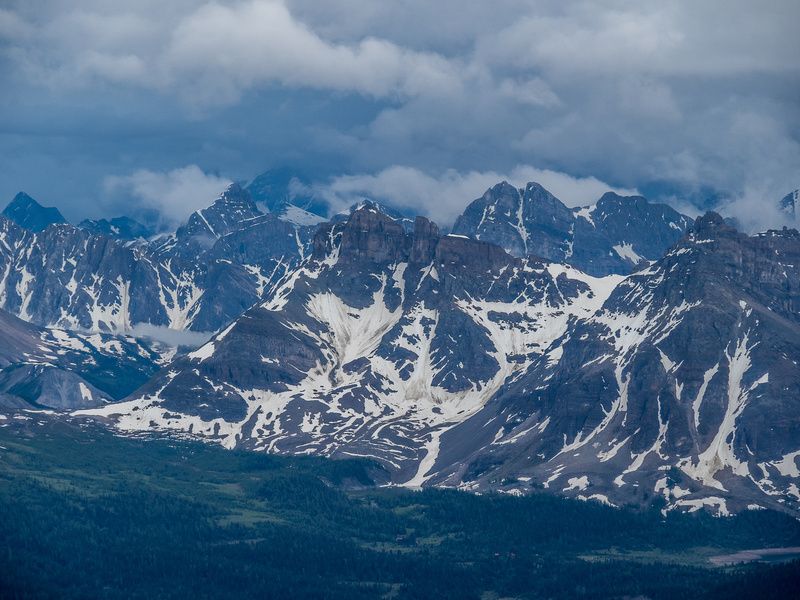 As the weather moved on I got some of the best photos of the trip with humid clouds swirling over the Great Divide in front of us on the ridge. There are advantages to hiking / scrambling in bad weather – you get some pretty unique views! The storm moves up the Simpson River Valley beside us. 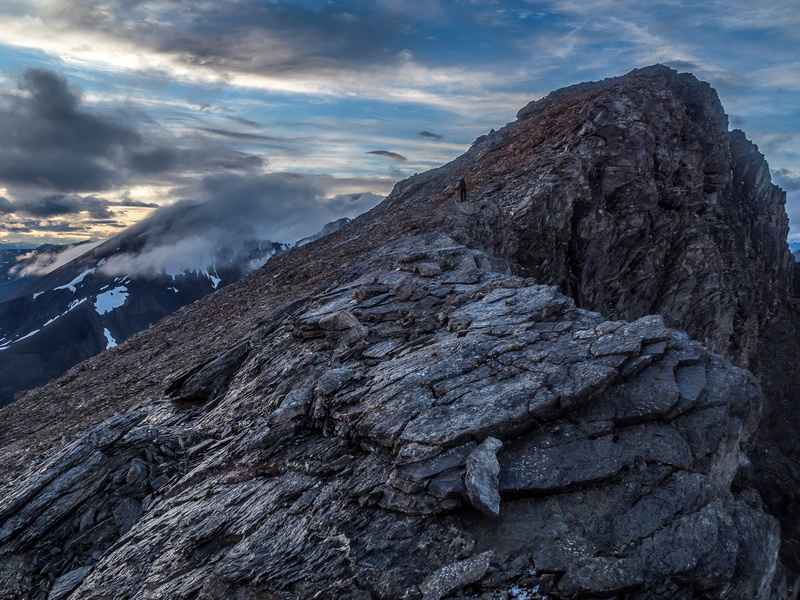 The sun sets as we traverse the north ridge of Golden Mountain. 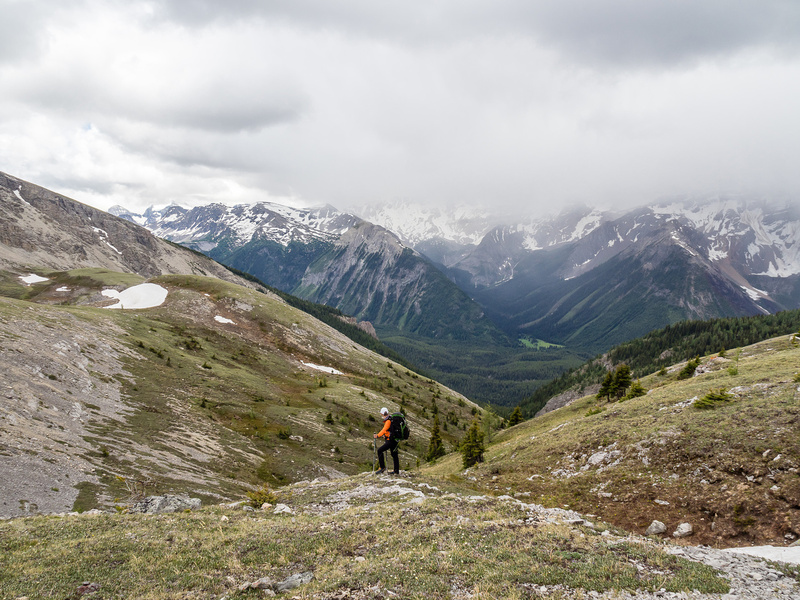 Very dramatic scenery as we continue to navigate the ridge to Fatigue Pass after the storm. 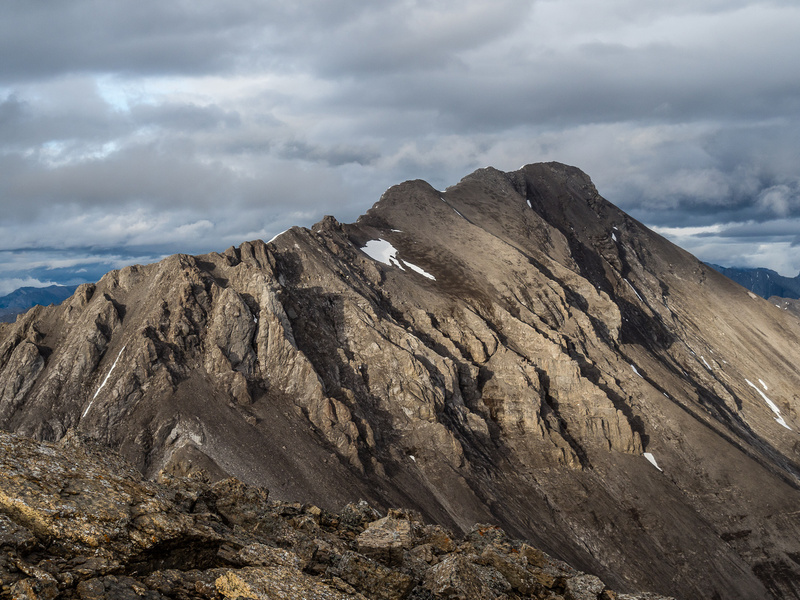 The last hints of a dying day come to a brilliant close as we continue down slope to Fatigue Pass with Fatigue Mountain and its eastern summit in front of us. 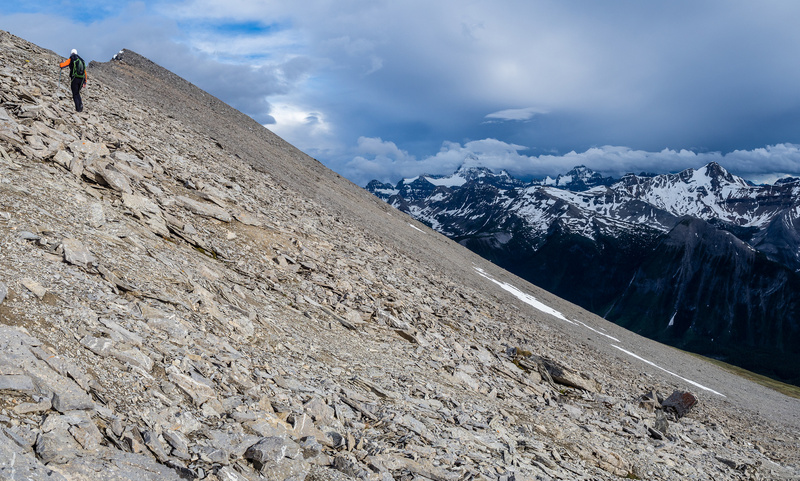 It was almost dark as we finally approached the north end of the ridge and decided to try a slightly more eastward descent to Fatigue Pass and our camp. This was a bad idea on hindsight, but it worked out OK. We stumbled into camp about 3:45 hours after leaving it, but remember we had a pretty long summit break. I didn’t even bother eating anything more when we got back to camp – choosing instead to crawl into my half bag and fall asleep. We didn’t even bother setting an alarm as most of our peaks were done on the first day already! A quick estimate puts our day at around 31km of distance and 2400m of total height gain. Not terrible, but hiking much of that with an overnight pack (packed for 2 nights and 3 days of food and gear) did add up to a fairly strenuous outing. Despite the weather and my tired legs, I enjoyed Golden Mountain more than I thought I would. 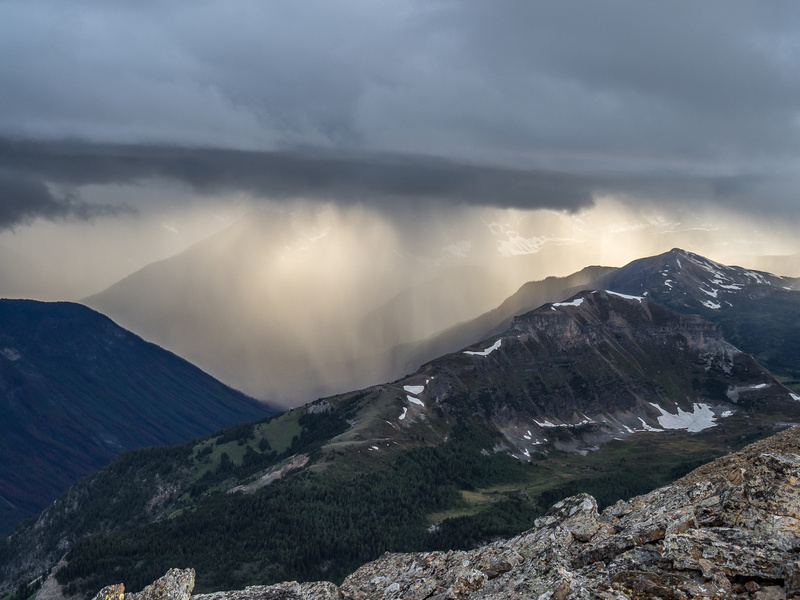 The passing storm made for some pretty incredible views on descent and the fact that we were the 4th recorded ascent party puts it way up my list of enjoyable ascents. 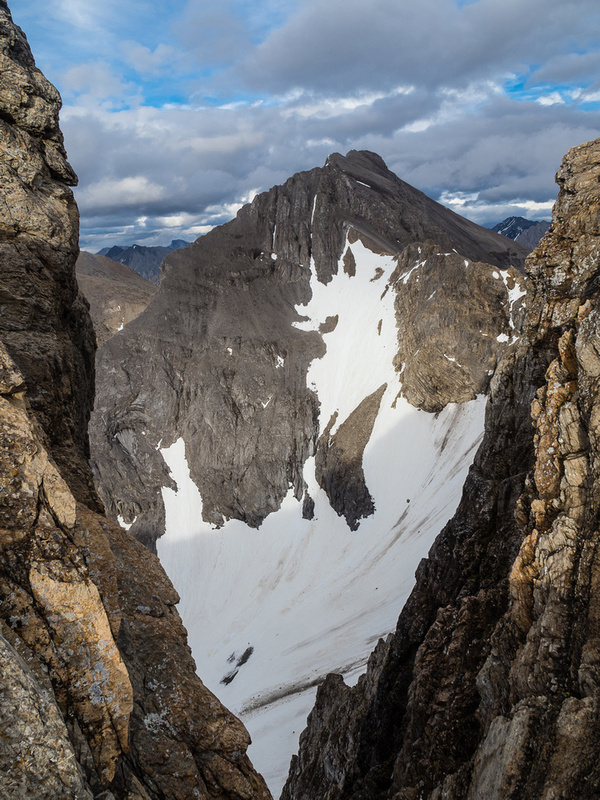 Where else in the developed world can you ascend a peak this visible, accessible and relatively easy and be only one of a small handful of humans over the past century (and for that matter, ever) to stand on its summit? Looking back towards Citadel Pass from the faint trail. 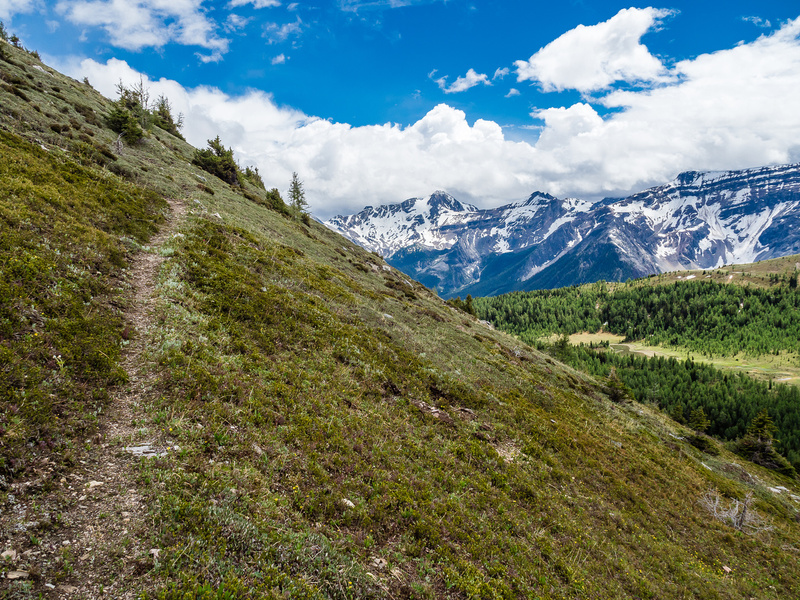 The trail becomes more defined temporarily at the switchbacks. Great views over Citadel Pass at right. Golden Mountain stretches out from Fatigue Pass. 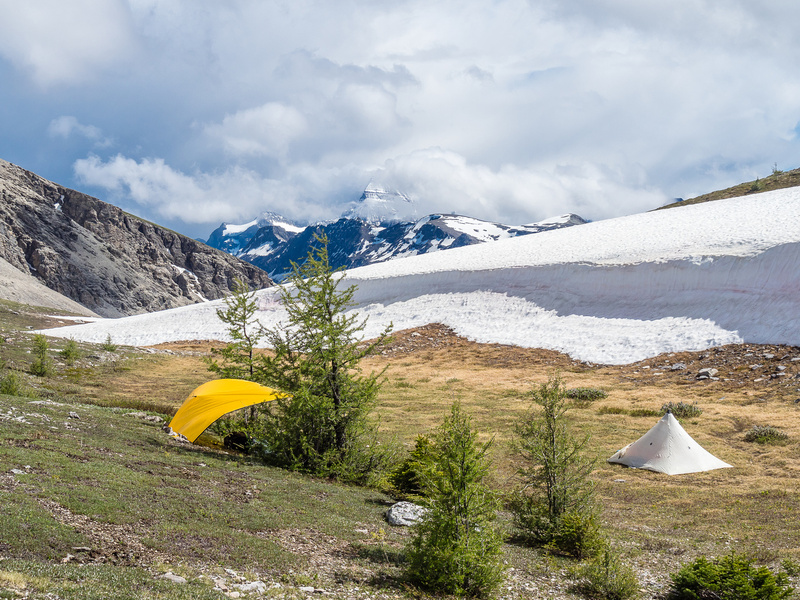 We'll go out of sight to our left before finding an ideal bivy site. Despite the somewhat gloomy weather, this place is gorgeous. An ideal bivy site. Golden's north end at left and Assiniboine just showing up at distant center. There are worse ways to spend a Friday afternoon. 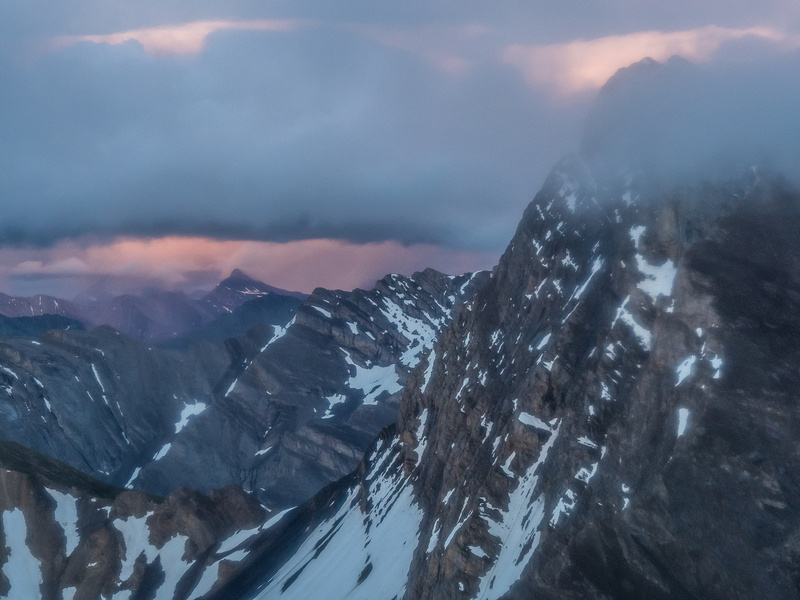 The Matterhorn of the Rockies peeks out from the clouds. Looking towards the north end of Golden Mountain at left. Nestor Peak and Simpson Ridge at center and distant right. North end of Golden Mountain. Surreal lighting as we continue to work our way along the never ending summit ridge of Golden Mountain - Assiniboine still showing at center distance. We came from the left and are going right here. The summit is still several bumps away but finally within our grasp. Only two more false summits... Nasswald at center here, with the summit of Golden Mountain to its right. An exposed view of Nasswald Peak. The name refers to the village of Nasswald, the birthplace of Konrad Kain in Aug 10, 1883. Finally we trudge up to the highest point on Golden Mountain. Nasswald at left here. 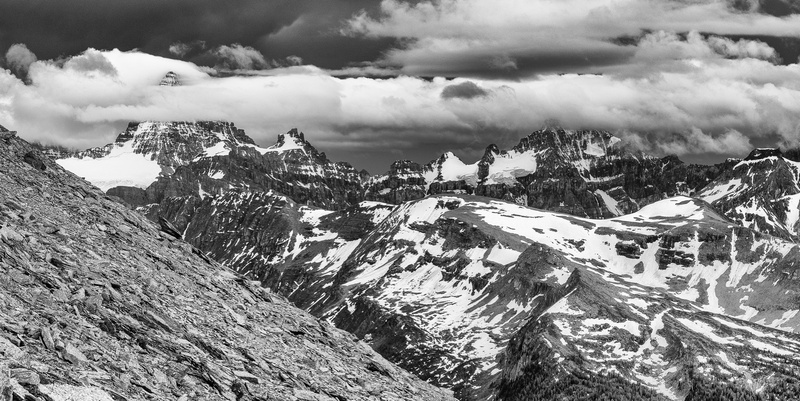 A panorama over the Assiniboine area includes many summits that I've been on and many more that I haven't. Looking back to the north where we came from, another storm front is quickly moving towards us in the fading light. Og Lake is looking very calm this evening. I wonder how many folks are camped there tonight? Wonder Peak with Byng and Aurora in the bg. Looking over The Towers and Naiset Point (R). Sundance Peak (C) is the highest peak in that range. 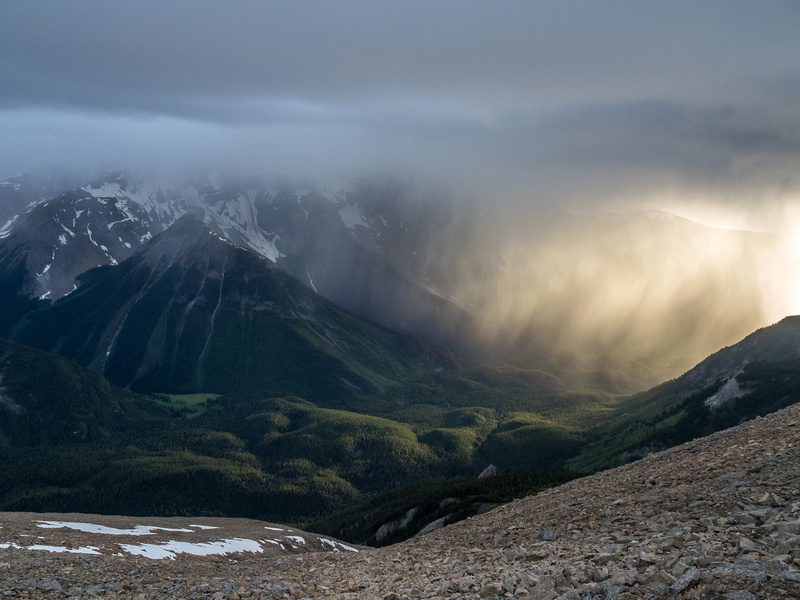 Dramatic back lighting on the storm from the setting sun over Citadel Peak. It's a race against darkness as we start the long egress to our bivy. It's much darker then this photo suggests and of course we have a storm approaching. Phil is all smiles despite a snow storm at the end of June at 21:30 high on the Continental Divide. Clouds and Golden's north ridge. 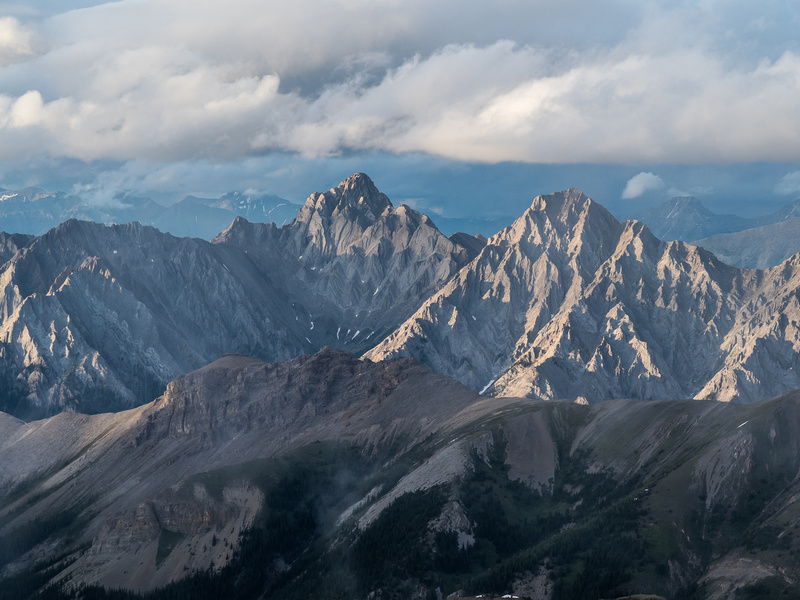 Setting sun highlights the jagged ridges on peaks in the Sundance Range. Good thing not too many of these peaks are named because they don't look easy! 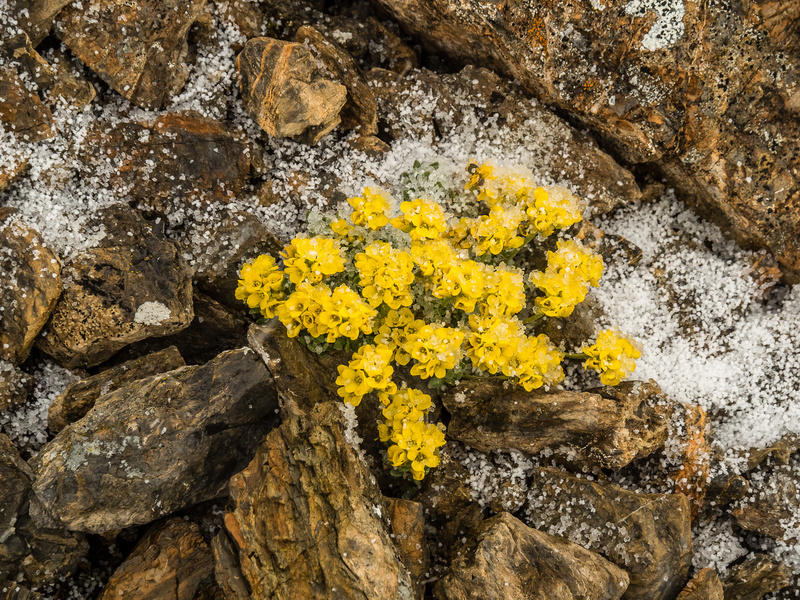 These are some might hardy alpine flowers (Golden Draba)! Navigating yet another false summit along the ridge. 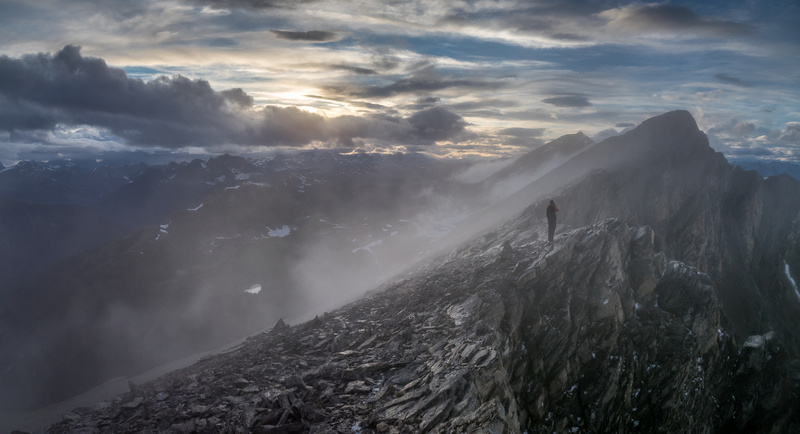 Scrambling in bad weather can have its positives, including scenes like this. Glancing back along Nasswald (R) towards Kananaskis Country.